Advising someone to eat onions for good health doesn’t exactly sound like fun. Onions are not what generally comes to mind first when you think about fixing yourself a nice healthy snack, are they? First, there is the strong aroma that an onion gives off. Then there’s the problem that you can’t really eat them on their own without some kind of preparation or cooking. Onions might not be at the top of your healthy snack list, but you should make efforts to include them regularly in your diet nonetheless. There are quite a few health benefits to eating onions and we’ve included just 10 below to get you started on understanding why this vegetable is so important for good health. Who knows? Our 10 amazing health benefits of onions post might just help you win that trivia competition on the weekend! Onions contain Chromium and Chromium help to fight insulin resistance. Controlling glucose levels is extremely important for those suffering from diabetes, and including onions in your diet can reduce the risk of you developing insulin resistance. Chromium is needed to assist with insulin activity when metabolizing fat, protein, and carbohydrates in other foods that are consumed. Maybe the term “an onion a day keeps the doctor away” will become a new saying! 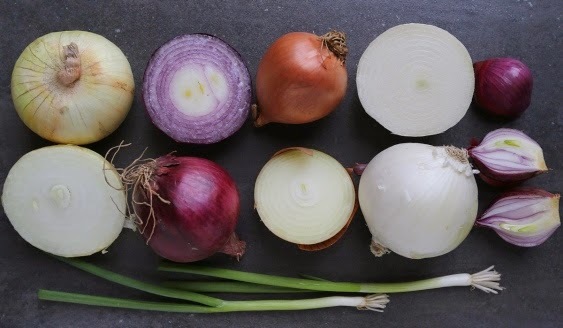 Remember there are all kinds of different onions and some have different health properties. For instance, red onions contain Quercetin. Quercetin is useful in helping the body to fight off free radicals, which are thought to be a factor in cancer. It also has many other beneficial properties including anti-inflammatory, anti-fungal, and antibacterial uses, too. Adding red onions to a salad each day could assist your body to reduce the risk of developing stomach cancer. Quercetin is believed to also aid in pain relief. Eating raw onion in a salad or with your evening meal can help to activate the natural pain-relieving properties of the onion. Tasty food makes you happy! Cooking and consuming satisfying food that’s good for you and tastes great is a definite health benefit. Onions add flavor and aroma to any dish and are often included in the base of most of your favorites. There are some religions that exclude onions from their diet, but most people find they add definite flavor to their meals and enjoy onions. Antioxidants are considered important in our diet to fend off cancer as well as minor illness. Onions are rich in Vitamin C and other recognized antioxidants, which can help to increase your body’s immunity. Onions are considered low GI. Low GI foods release their stored energy slowly into the body once they are consumed. Eating low GI foods has been found to benefit those seeking to lower their weight. You’ll feel fuller for longer if you make sure to include low GI foods in your diet. Onions are great for your tummy and your digestion. Eating onions help to digest your food, increase your appetite and guard against stomach cancers and gastric ulcers. Combating colon cancer is another benefit from eating of onions. The combination of Chromium, Vitamin B6 and the sulfur compounds found in onions has been shown to decrease cholesterol and lower blood pressure. This can assist in lowering the risk factors present for heart attack and stroke. Onions have been shown to inhibit the growth of tumors in animals. Scientists believe this is the reason they are so helpful as a cancer-fighting food. Onions are great for your skin. Acne, warts, bruises or wounds can all be treated by either rubbing on the onion juice or creating a poultice to apply to an injury. There is even evidence that rubbing onion juice on your scalp several times a week may promote faster hair regrowth. When you need a better night’s sleep, onions may be the answer! The phytochemicals in onions can help you be well rested. Eating onions in your evening meal is the key. Onion and tomato on toast or a steaming bowl of onion soup will definitely assist. Remember to choose a firm, fresh onions with no signs of growth or openings in the skin at the neck. Once they start to sprout they are past their prime and should be left on the shelf. Eating the green tops of spring onions will give you a great source of Vitamin A so remember to include them rather than throwing them away. Obviously eating onions alone will not result in the full range of health benefits outlined above, as your body ideally needs plenty of other healthy foods to keep strong. Including onions as part of a balanced diet, however, is on of the very best things you can do; and eating them both cooked and raw will give you the variety you need to get the most healthy outcomes and be satisfied as well.